It's been over 16 months since ToNeTo Atlanta first revealed that Daniel Reed's Public Kitchen & Bar would be opening at Phipps Plaza. Thankfully, despite the all too usual delays, the finish line is near. Jamie Durrence, managing partner of Daniel Reed Hospitality, spoke exclusively with ToNeTo Atlanta and said he plans to open Monday, February 26. Located on the Peachtree Road facing side of the mall, Public Kitchen opens in place of a portion of Twist, the once popular Here to Serve restaurant that abruptly shuttered (along withe restaurant group's other restaurants) in late 2015. Public Kitchen, which according to a mall representative occupies a 6,071 square foot space, will feature both an elevated outdoor patio (998 s/f) as well as limited "patio" seating (292 s/f) within the mall itself, adjacent to the restaurant's interior entrance. The Buckhead outpost is "significantly" larger than the original Public Kitchen which opened in West Liberty Street in historic downtown Savannah in 2012. The menu for the Phipps Plaza location has not been released but will reportedly be similar to the Savannah outpost with such offerings as a lamb burger, Lavazza Coffee, Savannah Shrimp & Grits and more. Having toured the restaurant earlier this week, it's definitely fair to say that "the juice is worth the squeeze." The restaurant, designed by creative director Robby Perkins, mixes mid century modern chic with detailed craftsmanship to create a space with plenty of character while still tastefully upscale. In addition to Public Kitchen & Bar, Phipps Plaza recently welcomed Genuine Pizza to the former Yebo space and will welcome Grand Luxe Cafe to the former second floor Frontgage space later this summer. [Frontgate is still in the mall, and still on the second floor, but is now closer to Nordstrom.] Simon Property Group, which owns and manages Phipps Plaza, has installed a pair of elevators in front of Public that will take patrons directly to Grand Lux, situated above. 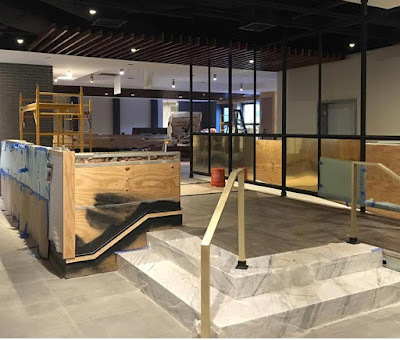 Ecco, the popular Mediterranean restaurant from Fifth Group Restaurants, is also opening at Phipps Plaza, but in a newly constructed freestanding building at the intersection of Wieuca and Peachtree Roads, adjacent to the AC Hotel. Ecco, first announced in early 2016, is expected to open late this year. As ToNeTo Atlanta reported this past November, Phipps Plaza will also welcome a new Nobu Hotel & restaurant as well as a 30,000 square foot food hall in the coming years. The multi-phase project, which will take shape where currently the Belk department store sits, is expected to begin construction late this year and potentially open as soon as late 2019. Durrence, although a newcomer to the Atlanta restaurant scene, is an eighteen year veteran of the restaurant industry and was last fall honored by the Georgia Restaurant Association as its Restaurateur of the Year. Simon Property Group's Michelle Smart, Director of Leasing for both Phipps Plaza and Lenox Square, is responsible for the recent string of restaurant [and retail] leases at both Buckhead malls. While there has been no definitive update, it is believed that Smart is in serious discussions with other restaurant operators for both the remaining Twist portion as well as the long vacant Prime restaurant space at Lenox Square. Have you ever been to Daniel Reed's Public Kitchen & Bar? Are you excited by the recent and upcoming changes at Phipps Plaza? What type of restaurant would you like to see open in the remaining former Twist space? That bathroom doesn't hold a candle to the one at the Oak Bar at the Hermitage Hotel in Nashville. The bathroom alone is worth the trip! Three cheers for the new Public Kitchen & Bar at Phipps Plaza! A mid-century modern masterpiece with the best farm-to-table fare and pour of wine in town! The artwork is swoonsville and the entire place glows with warmth and chic. Already chosen my fave perch. Come join me!